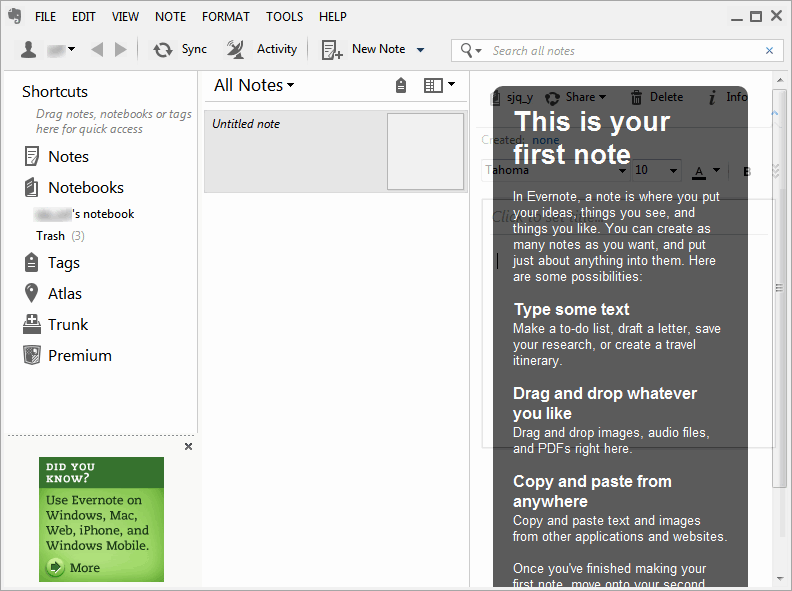 Evernote is a free and convenient notetaking software to help you manage your personal information. Save your ideas, things you like, things you hear, and things you see. Evernote uses tags and notebook stack to manage all the stored notes. For notes list, there are 3 view mode: List, Snippet and Thumbnail. Then you could create, manage, search in a rather easy way. Spend less time searching–view all your shared notes and notebooks from the Shared section in the sidebar. Speed up the syncing process–limit sync to recently changed and frequently used notes. To turn it on, go to Tools > Options > Synchronization and select "Enable on demand sync." Handling of large notes including those with big images or attachments on 32-bit systems. An intermittent error syncing when connecting to a business account for the first time. Issues with the printing of notes with tables.